It's been a year since you married and you want to get that first anniversary gift just right. Understanding all the intricacies of what present you're meant to give for a particular anniversary year can be tricky business. Sure, suss it out with your loved one first, but ultimately it's entirely up to you which way you want to go. You can choose tradition or choose something from the heart. These 1 year anniversary gift ideas cover the best of both worlds - the world of love. 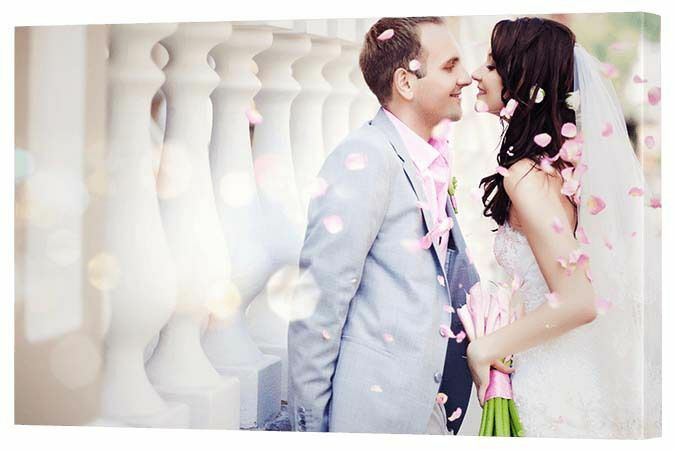 It's time to transform those gorgeous digital wedding photos into beautiful wall art. 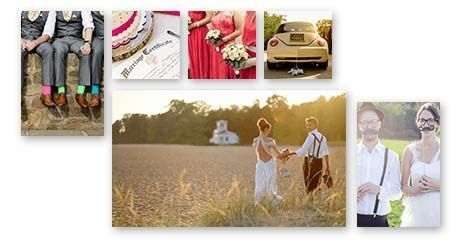 You've received a stunning collection of digital photos on a CD from your wedding photographer, but you've both been too busy to arrange professional prints. This stunning canvas wall display will make up for it! This is a wonderful surprise gift or a present you can both enjoy creating together. It's hard to believe that amazing honeymoon holiday was a year ago, but building a collage canvas is a wonderful way to remember the good times. Gather together all those precious moments from your holiday to remember and design a collage he'll love to look at. You may find them on your holiday camera, Facebook or Instagram. Either way, choose five of the top photos that encapsulate your time together - and your love. He may even wish to use it to decorate his home or workplace office. It's always helpful to be surrounded by people you love when times get rough at work! 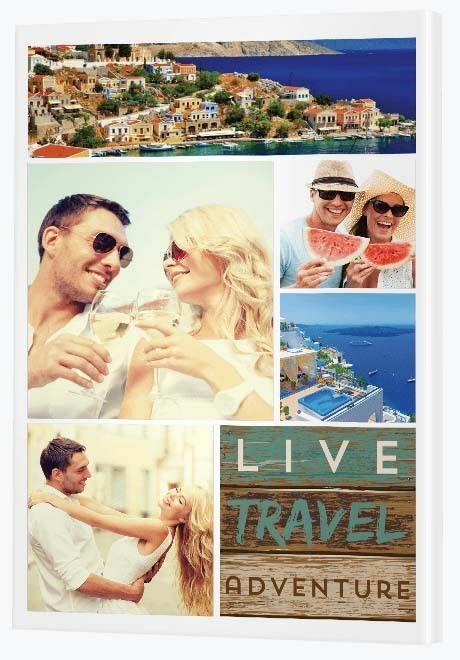 And this themed travel collage template is perfect for that type of interior design (and for a man!) because it's not all soppy and gushy. It has a bit of edge and lets the photos speak for themselves. In fact, he'll love showing it (and you!) off to everyone who walks into his office. 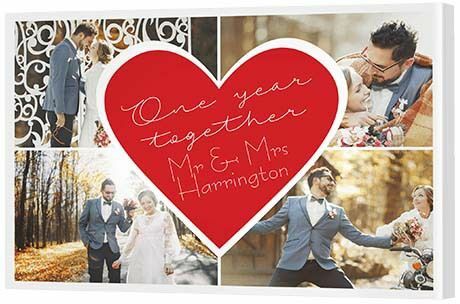 Paper is the traditional present for 1st wedding anniversaries, so if you're after something outside the box add stretched canvas to your gift list. Watch her eyes light up when she receives a contemporary canvas art print. She won't even see it coming! OK so our canvases are made from matte cotton, but with a GSM count of 360 we believe they look like beautiful thick quality paper, so let's just call it poetic licence. Browse our contemporary art collection to find something for your loved one. You've known her for a year now, so she'll be expecting you to choose something that's 'very her'. If you're struggling, just ask a bestie or a sister for some tips! Sure you could buy a clock to fulfil your modern 1st year obligation, but where's the fun in that? This is a gift from the heart, inspired by time. 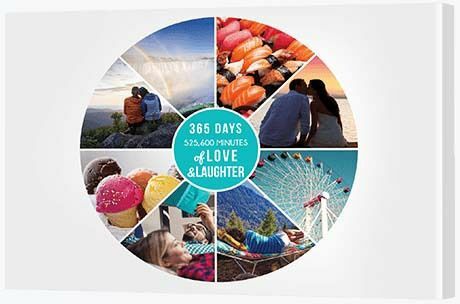 Fill this clever circular modish collage with a wheel of photographs chosen from the experiences you've had together over the last year. You can design the quote in the centre frame using an easy custom graphic design tool like Canva with whatever background colour and font style you like. Just make the graphic square and leave plenty of space around the edges so you can place it in a circular frame without a worry. Give him a gift he'll love rather than one he'll reluctantly accept. Only you know what that is. While it's been a year married, you've known him for longer. You know what he likes. You also know what he abhors. Think of his passions and print them to canvas. Does he love golf? Build him a golf collage. Is he into hiking? Print a rainforest photo on canvas. 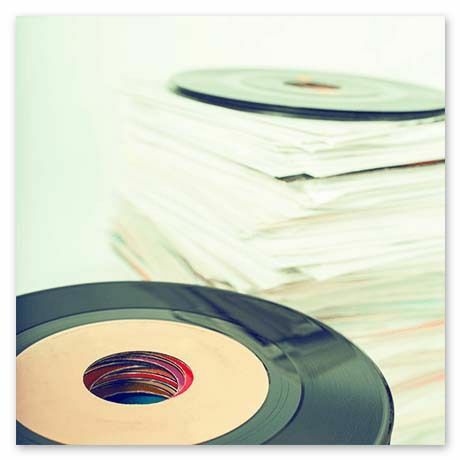 Is he a collector of LPs? Print a funky retro print. With a gift like this, you can't go wrong. You won't risk choosing the wrong golf ball or buying the wrong album! And yet you'll still show him you know exactly what he likes. Discover art galore in our Canvas Art library. 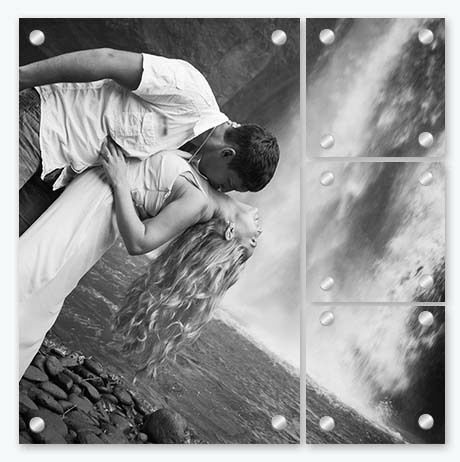 Turn up the romance with a split image black and white glass print, a creative way to display those precious, loving moments together. 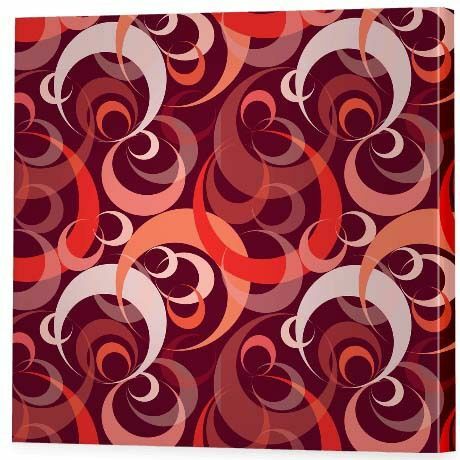 This print has it all - romance, creativity and art. The photo itself oozes romance as a couple embracing under a waterfall tends to do! Find a photo of the two of you together that depicts a similar mood - or arrange something special in advance. Creatively, the photo is printed as a split image on glass. Splitting an image across four panels (one large and three small) is a stylish way to present a picture. Printing it on glass adds that extra touch of class. And when it comes to art, black and white is your friend. Simply convert your colour photo to mono when you're creating your print in the Canvas App. This touching gift is something your spouse can have by their side each and every day, as a reminder of your love. The hustle and bustle of life can sometimes get the best of us. We may tell our partners we love them, but rarely do we have time to recite them poetry or truly share from our hearts the way we feel. 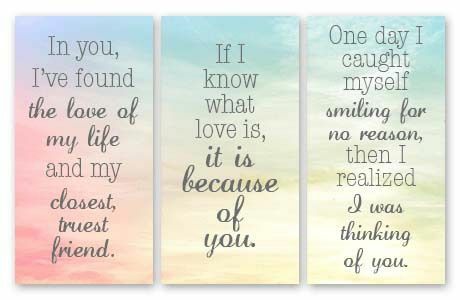 A canvas wall display of quotes is a thoughtful way to express those sentiments we want them to know and remember. Remarkably, you can design your own unique quotes using Canva then, after downloading them, upload them into Canvas Factory's CanvasApp. 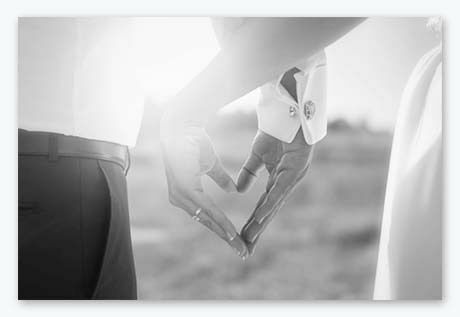 Take that arty photo from your wedding day and give it the treatment it deserves - print it on metal. If you think you've printed all your wedding photos, think again. There is always that one special image you have no idea what to do with because it simply doesn't fit it with any of the others. Make it stand out from the crowd by printing it on metal. For something edgy, give it the black and white treatment. If it has plenty of sparkle, print it in colour. Your fur babies are now part of your family, so honour the new loving family unit with a beautiful canvas print. You're not yet ready for kids, but your fur babies have well and truly taken hold of your hearts. 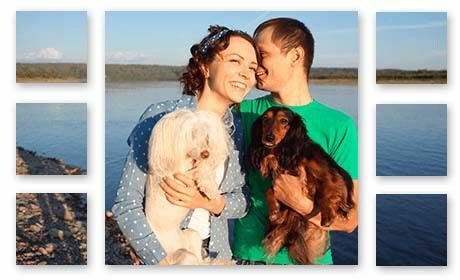 Arrange a photo with your half human, half fur family in a charming location and print it onto a split image canvas. Splitting the canvas across seven frames draws attention to the beauty of the background while centring on the fun of the foreground. Relive the journey of love with a wall display that brings together the best of the year that was. The first year of marriage can be hectic, what with an engagement, wedding, honeymoon and honeymoon period of picnics, travels, family and friends. Relive the magic of those precious loving memories for years to come with a wall display that captures the best of those moments. Present it to your loved one and watch as they mount it pride of place in your home. Be the best bridesmaid ever, gifting the one-time bride in your life with a present from the heart. This personalised heart print from our modish collection looks fancy, but is actually quite simple to create. As the bridesmaid, it's likely you've been given a copy of all the photos. Alternatively, you'll find them on Facebook. Gather photos of the happy couple together on their wedding day and surprise them with an elegant collage. Create the personalised text for the centre heart frame using an easy graphic design tool like Canva.